Deborah Harroun has a way with red velvet and has compiled a whole book of delights The Red Velvet Lover’s Cookbook. 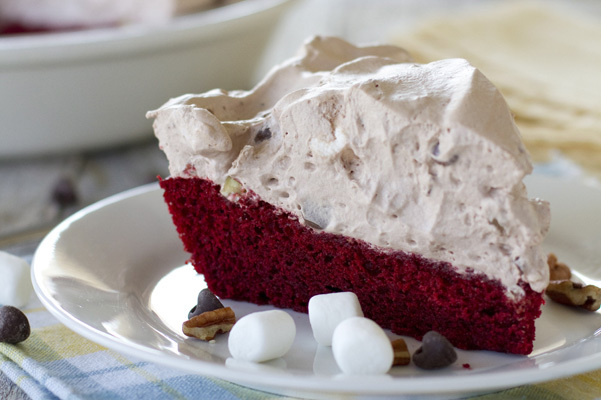 This pie features a red velvet base, which is actually a cake baked in a pie pan, and crowned with a light whipped cream topping speckled with marshmallows, pecans and chocolate chips. Also check out her red velvet Whoopie Pies. What could be better than cake topped with a mountain of whipped cream, marshmallows, chocolate chips, and pecans? While this is technically not a pie at all, it is served in a pie dish. I’ve been eating a chocolate version of this cake ever since I can remember. To make the cake: Set a rack in the center position and preheat the oven to 350ºF. Spray a 9-inch pie pan with nonstick cooking spray. Beat the oil and sugar in a large bowl. Beat in the egg and then scrape down the sides of the bowl. Stir one-third of the dry ingredients into the sugar mixture, then stir in one-half of the buttermilk. Stir in the remaining dry ingredients and buttermilk in alternating additions. Stir in the red food coloring and vanilla. Combine the vinegar and baking soda in a small bowl (it will bubble up). Fold into the cake batter. Spread the batter in the pie pan and bake until the cake springs back when lightly touched, 30 to 35 minutes. Let the cake cool completely on a rack. To make the topping: Whip the heavy cream in a large bowl with an electric mixer until the cream starts to thicken, then gradually add the confectioners’ sugar, cocoa, and vanilla. Continue until the cream forms stiff peaks. Gently fold the marshmallows, pecans, and chocolate chips into the whipped cream. Pile the topping onto the cooled cake. Refrigerate until ready to serve.